I read this article and found it very interesting, thought it might be something for you. The article is called Illiterate, Married at 11, Mother At 12: Panchayat President Now Changes Fates and is located at https://archive.indiaspend.com/special-reports/illiterate-married-at-11-mother-at-12-panchayat-president-now-changes-fates-24746. Sidhamallamma Kanchappa, 32, a tribal panchayat president of the Padiganalm village, in Krishnagiri district, had her first child at 12. That experience taught her the importance of women’s health and control over their bodies. She got herself trained as a health worker and actively monitors reproductive and maternal health of women in her panchayat. Padiganalam, Krishnagiri district (Tamil Nadu): Married against her wishes at 11 to her dead sister’s husband, Sidhamallamma Kanchappa gave birth to her first child at home when she was 12. It was 1998, the child nearly died, and the doctors at the hospital chided her and the family for marrying so young. So, when Sidhamallamma–from the Irula tribe, famed as snake catchers–was elected the president of the remote Padiganalam panchayat in Thally block of Tamil Nadu’s North-western Krishnagiri district in 2011, she made women’s health a priority. In this panchayat, situated among the craters of granite mines, early marriage, frequent pregnancies, anaemia and malnutrition are just some of the health issues that women are plagued with. For a landless, former seasonal migrant daily wage labourer, who once earned Rs 80 a day cutting stones in Bengaluru, Sidhamallamma saw her new position in life as an opportunity to spread awareness on women’s reproductive health. She has an easy way of talking, using humour and a fast-talking style to connect with women much older than her. Sidhamallamma is one of 40 past and current women panchayat leaders we surveyed across six Tamil Nadu districts to analyse the impact of a quarter century of reservations for women in local bodies. We found a majority of women now work independently of the men in their lives and despite a series of hurdles that deny them access to finances, male-dominated political networks and limited powers, they had carved out distinct identities for themselves and overtaken men in building roads, providing drinking water and toilets, as the first part of this series explained. Tamil Nadu now has India’s lowest fertility rate–lower than Australia, Finland and Belgium–second best infant mortality and maternal mortality rate, and records among the lowest crime rates against women and children, as IndiaSpend reported in December 2016, but caste discrimination is entrenched and women in rural public office still face resistance from men. But the rise of women panchayat leaders indicates the benefits that reservations for women bring. ‘Women would have endless babies. They had no idea of contraception. In the beginning, I had to beg and plead them to get themselves operated after two kids,” Sidhamallamma said as she took us around her village and indicated why anaemia is a major health concern for women in this block and Krishnagiri district as a whole. More than half (55.1%) the women between the ages of 15 and 49 in Tamil Nadu are anaemic, according to National Family Health Survey 2015-16 (NFHS-4) data, the latest available; 2.4% women are severely anaemic (with haemoglobin count less than 7 grams per decilitre). In Krishnagiri district, 47.4% of rural women between the ages of 15 and 49 were anaemic, 2.2% were severely anaemic, NFHS-4 data revealed. This the second lowest in the state, after Karur district in the central Tamil Nadu. Apart from ignorance, the women here are plagued by fear of surgical procedures in general and government hospitals in particular–especially the larger taluk (block) and district hospitals. The local health sub-centre (HSC) does not deal with deliveries in severely anaemic cases, and women have to be taken to the Denkanikottai, 20 km away, or to Hosur, about 40 km away. Forested, hilly and with few surfaced roads, Thally is hard for government health professionals to access. “Access is the main issue. Sometimes we have to walk several kilometres because even our jeeps won’t reach there,” said Keshav Raj of the Association for Rural Community Development (ARCOD), the monitoring partner for United Nations Children’s Fund’s (UNICEF’s) ante- and prenatal-care project, which monitors women’s reproductive health in 36 of the most vulnerable villages in Thally and neighbouring Kelamangalam block. “The bigger problem is the absentee Village Health Nurses (VHNs), who refuse to stay in these kinds of difficult areas for very long. Many HSCs share a single VHN now as there is a terrible shortage,” said Sacharita (she uses only one name), Thally’s block health officer. In the 36 most vulnerable villages that ARCOD monitors, 11 of 17 HSCs do not have a nurse. “In such cases, a single nurse has the responsibility of two or more HSCs, increasing their commute and effort,” said Raj. The HSC at Balagondapalli, which services people from Padiganalam panchayat, shares the VHN–the nurse’s position is vacant–with Agalikotta, a nearby panchayat. This is true of Accredited Social Health Activists (ASHAs), who serve no more than 23% of Tamil Nadu, according to District Level Household and Facility Survey, 2012-13, data. In comparison, ASHAs are available in greater proportions in Andhra Pradesh (91.7%), Karnataka (96.1%) and Kerala (94.4%). In Krishnagiri, 23.8% of villages are served by ASHAs. It was the paucity of ASHAs in Padiganalam that prompted Sidhamallamma to get herself trained as a health worker in 2014. “I tell women that they should eat greens, especially drumstick leaves and jaggery, to improve their blood (haemoglobin). When I had my first child at 12, my haemoglobin level was less than five (grams per decilitre). So I know the pain first hand,” she added. Sidhamallamma repeatedly emphasises the link between better health, early pregnancies and child marriages. She uses the gram sabha (local council) and other avenues to spread the word. As a panchayat president, she is quite limited by the powers she has to influence healthcare delivery beyond awareness-building and persuasion. The Tamil Nadu Health Department’s guidelines limit the role of panchayats to create awareness and ensure proper sanitation in villages in their devolution of powers. The panchayats neither have the funds nor the authority to either demand for a HSC or a VHN. Gram panchayats are given Rs 10,000 a year to buy material such as water purification tablets and bleaching powder to provide for sanitation. If there is one challenge she has not been able to overcome in her term as a panchayat president, it is building and use of public and individual household toilets. 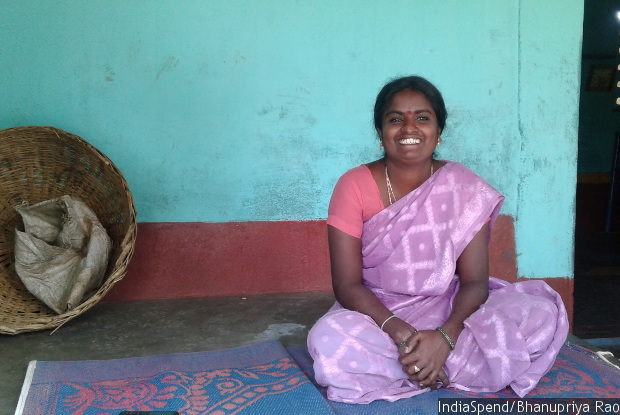 Sidhamallamma knows it is not easy to change traditional attitudes. But she would like to try. In 2017, she will stand for re-election–although her constituency is now a general constituency with no reservation for women. This is the second of a four-part series. You can read the first part here, the third part here and the fourth part here.